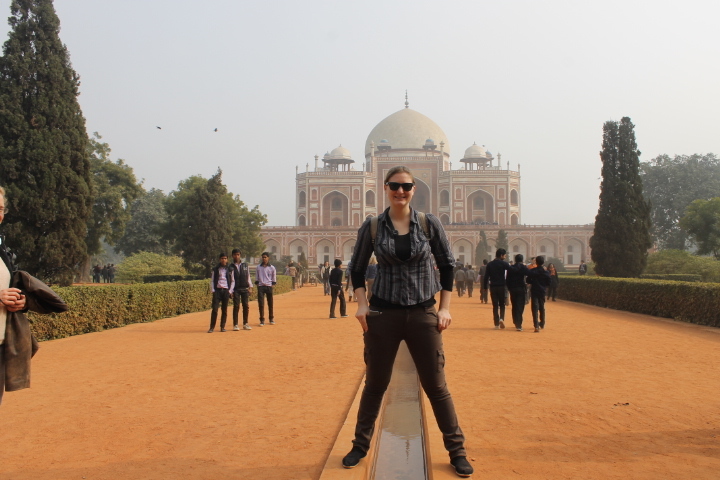 With nearly a full day to myself to spend exploring Delhi, I was determined to see as much of the city as I could before meeting up with the rest of my group. My successful navigation of the metro system on the previous day did wonders for my confidence, but I still did a hefty amount of research and Googling at a nearby coffee shop before making my way out into the city. I’ve taken the metro in Tokyo during some rather crowded times, but that still didn’t prepare me for the sheer number of people, both in Delhi’s metro stations and in the cars themselves. It was one of those moments that I just had to take a deep breath, plunge into the crowds, and keep moving. For all of my initial nervousness, the metro in Delhi is fairly easy to navigate. All of the announcements regarding upcoming stations and line changes are given in both Hindi and English, and there are only six lines, which are denoted by colors. My station, Karol Bagh, was located on the Blue line. It’s also mind-bogglingly cheap by Western standards. Most of my 30+ minute rides across the city cost around $0.25. Compare that to a six-minute, three-dollar metro trip in inner Tokyo! One of the things I liked best about the Delhi metro was the use of women-only carriages at the tail end of every metro. If nothing else, they were usually much less crowded than the other cars. 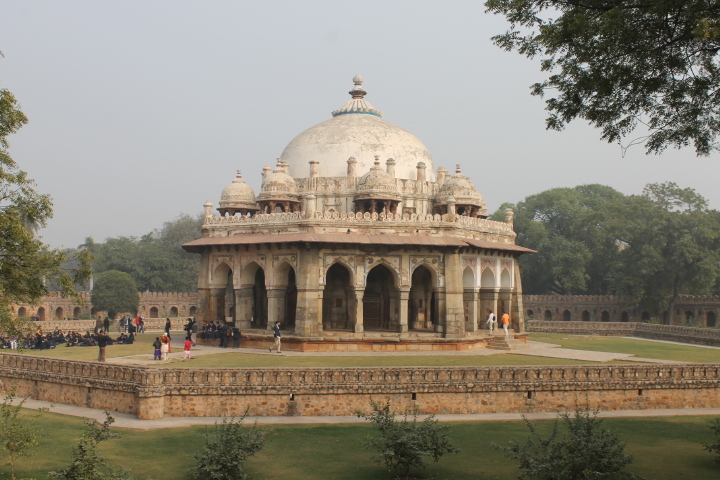 Unfortunately, many of the monuments in Delhi, like the Red Fort, are closed on Mondays, so my options were a bit more limited than if I’d been in the city another day. That being said, I still found plenty to keep myself occupied. 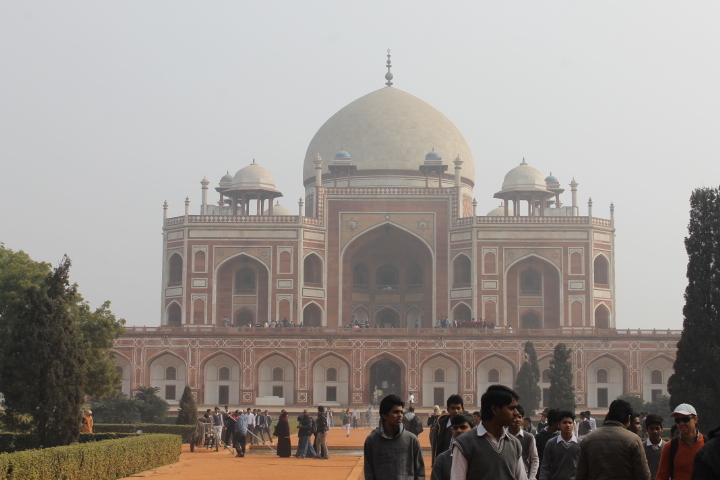 First, I headed off to Humayun’s Tomb, one of Delhi’s most famous landmarks and a UNESCO World Heritage Site. 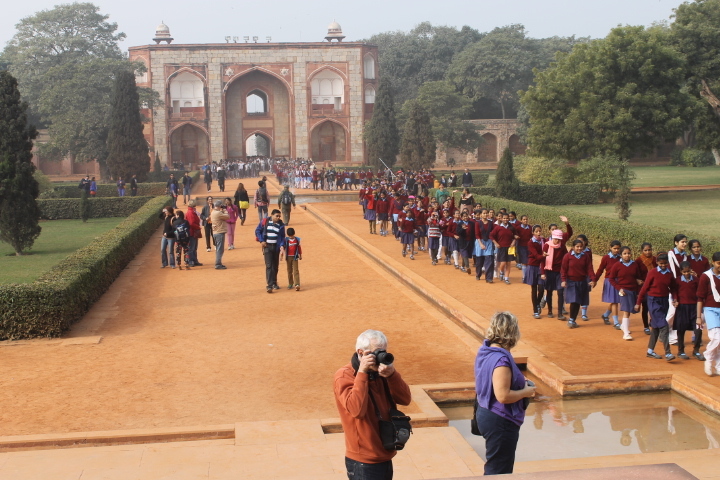 Like many of India’s monuments, there are two separate entry fees: 10 rupees for Indian citizens and 250 rupees for foreigners. 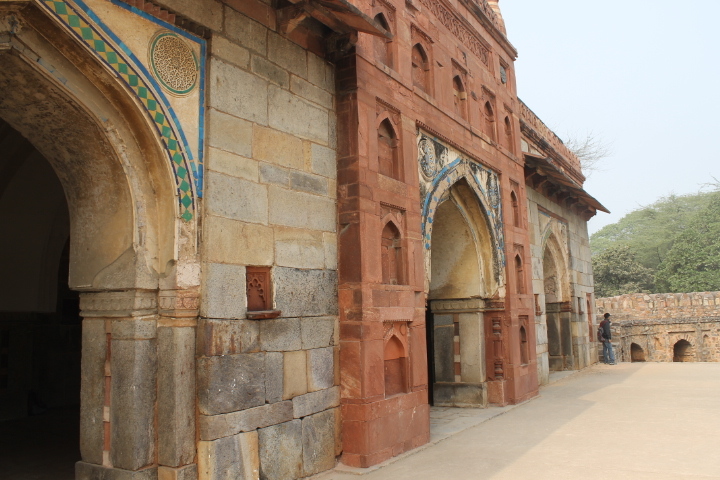 Before I even made it to Humayun’s Tomb, monuments that dotted the pathway distracted me. 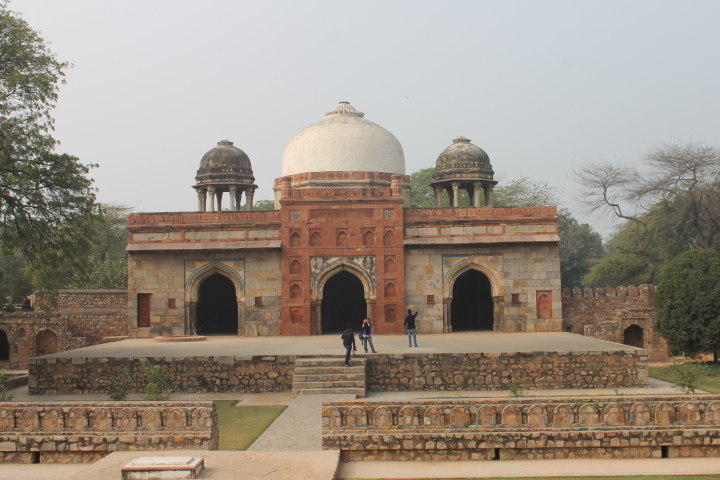 That included the tomb of Isa Khan Niyazi, set off in its own walled enclosure and raised on a grassy dais. I’ve seen more European castles and palaces than I can count, and the same goes for Japanese shrines and temples. Both of those are incomparable to the Mughal architectural style, with its bulbous domes, soaring minarets, and intricate carvings. The awe I felt standing in front of these buildings, built out of reverence and loyalty more than two hundred years before my own home country was even founded, never ceased or became weaker. It’s not all red sandstone. Inlaid turquoise and emerald designs rim many of the doorways. 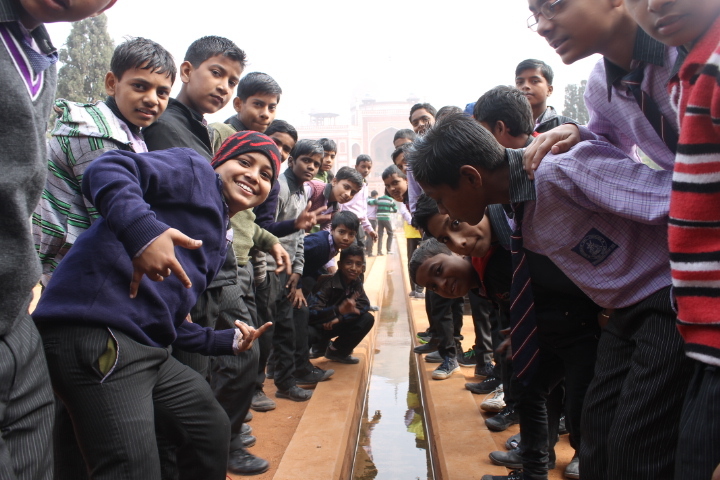 It seemed like every school within a twenty kilometer radius was out on a field trip that day. A steady stream of uniformed students flooded the garden, and I lost count within about two minutes of the number of excited “Hello! Hello! Good morning!”s that were excitedly shouted my way. We fit quite a few into the frame of my iPhone’s camera. Most of the younger girls were content with offering just a wave and a greeting, but the older students were braver. One of them approached me with a serious expression and asked, “May I ask you a question? 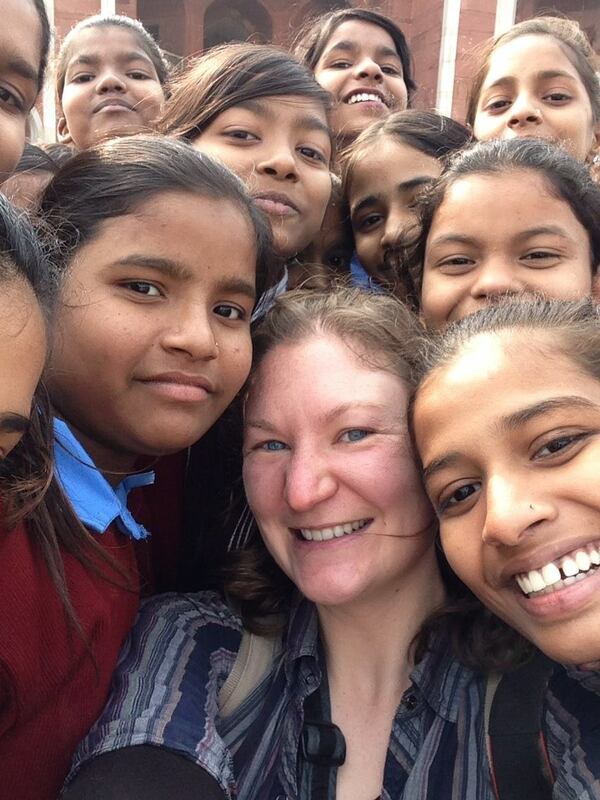 Are you a One Direction fan?” I couldn’t help but laugh (though certainly not at her English or accent, which were both impeccable) at the sheer absurdity of coming to India and being asked about a British boy band. The boys were even braver still, asking for picture after picture with me. 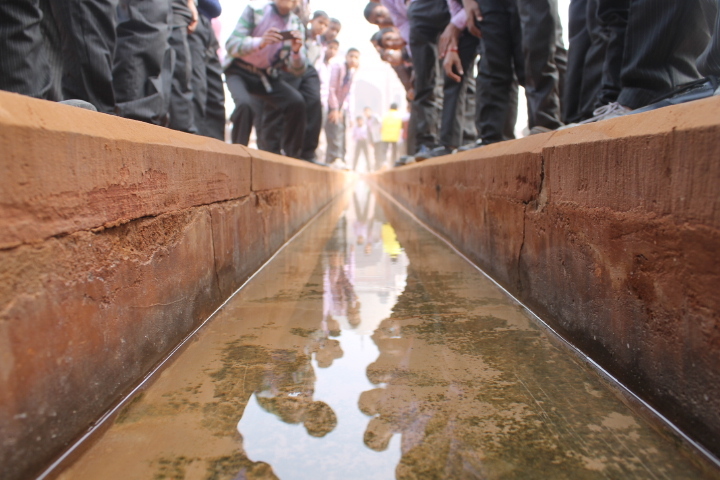 I caught the attention of some of the students. And then it was pointless. 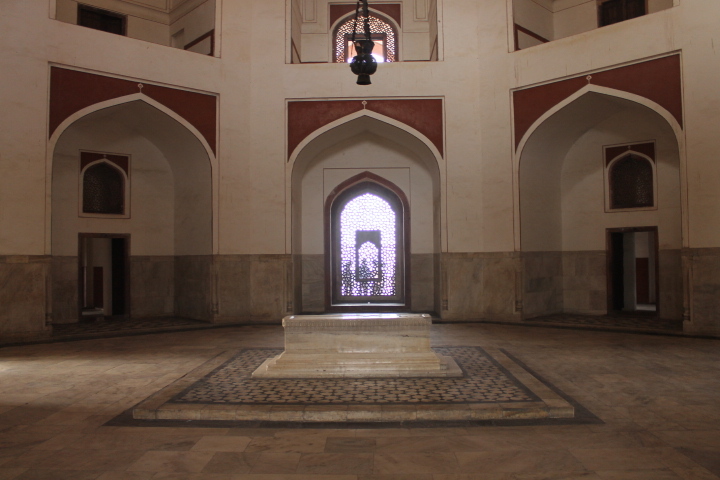 Humayun was a Mughal emperor in the 1500s, and his wife commissioned his tomb in his honor. 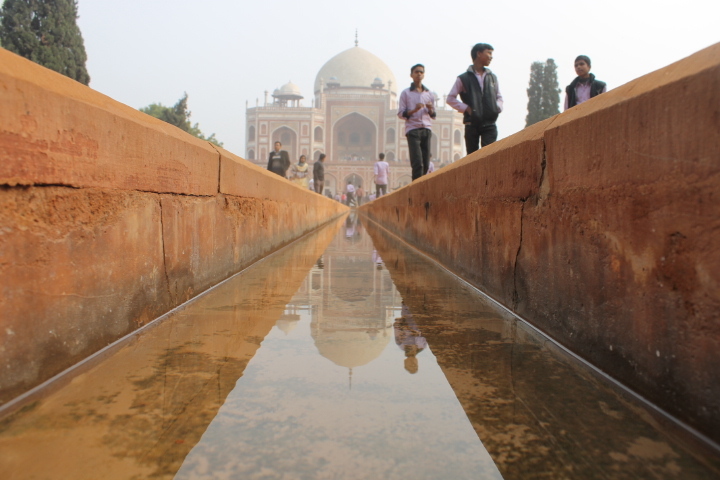 Anyone who looks at Humayun’s Tomb will likely immediately be reminded of the Taj Mahal, and there’s a good reason for that: it ushered in the Mughal style of mausoleum that the Taj so famously epitomizes. Its exterior is a unique combination of red sandstone and white marble. The day I visited the tomb was sunny, dusty, and warm; it took about five minutes in the sun before I had to shed my outer jacket, but as soon as I stepped into the interior, the temperature dropped palpably from the insane amount of chilly, slick marble that makes up the inner chambers. Silent, shadowy, and chilled inside. 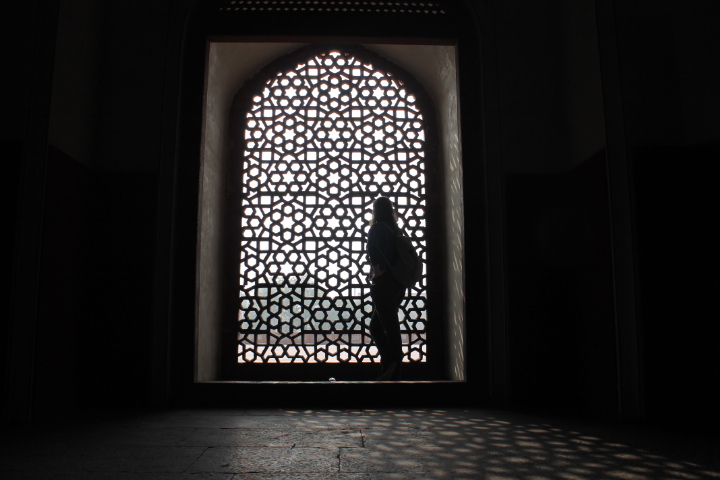 Sunlight filters through the window screens, making for some very cool silhouettes. 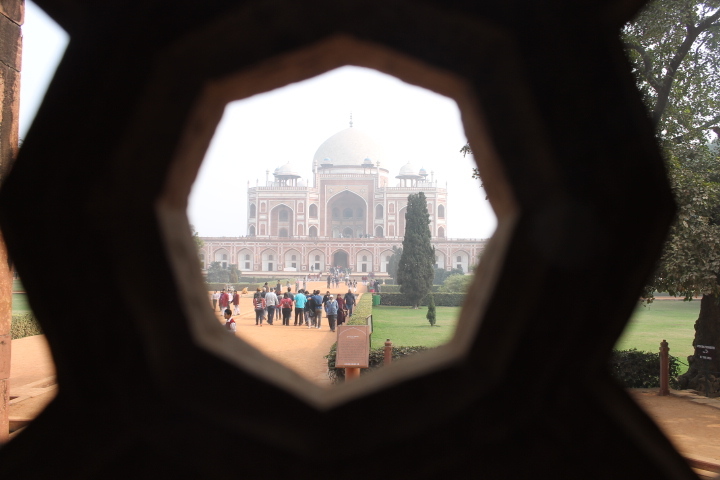 As stately as Humayun’s Tomb is, that grandeur is only magnified by the surrounding Char Bagh Garden. It’s easy to see why these Persian-style (of which Char Bagh was the first in South Asia) enclosures are often referred to as “paradise gardens.” Delhi is a place of maddening chaos, but within the high walls of Char Bagh, the blaring horns and insistent street hawkers fade away to peaceful stillness. And on my first morning in Delhi, that was exactly what I needed to dip my feet into the city. Getting arty with one of the West Gate’s windows.